Even the best quality air compressors often have no hoses included or the ones that are included are very poor quality. They expect people to buy aftermarket hoses for their new air compressor. 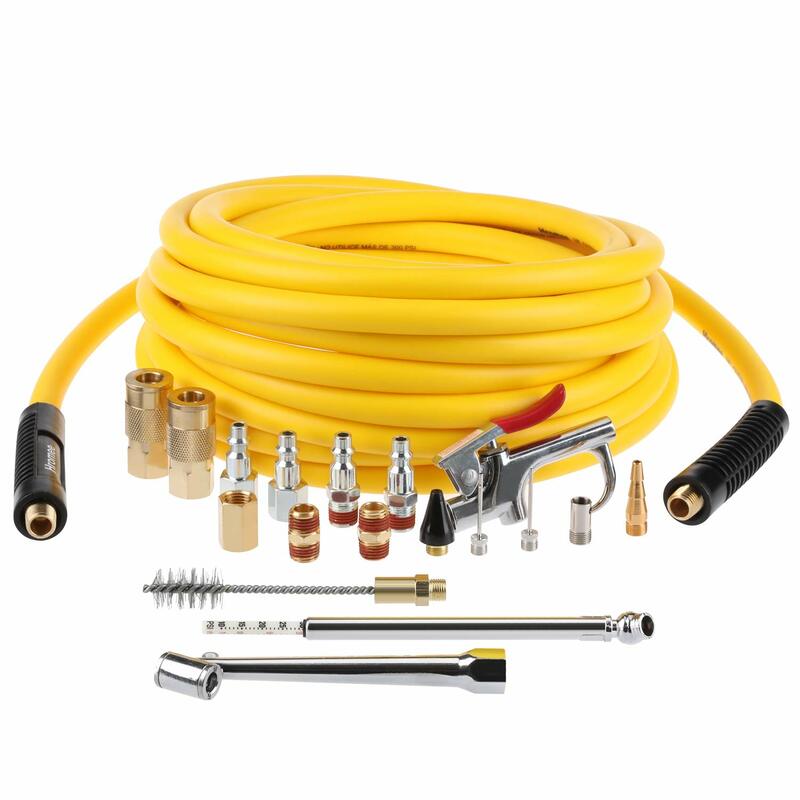 We are here to tell you how to go about finding the best air hoses to use with your air compressor. This article is closely related to our hose reel article. If you want to protect your hose in a shop setting, or you are working with lengths longer than 30 feet, you will likely want a hose reel (jobsite contractors excluded). These are some of the absolute best air compressor hoses you will find in the tool marketplace. There is a lot of variety in the hose choices. In most cases, you will want a 3/8-inch if volume is important (sandblasting, impact wrenches, framing nailers). 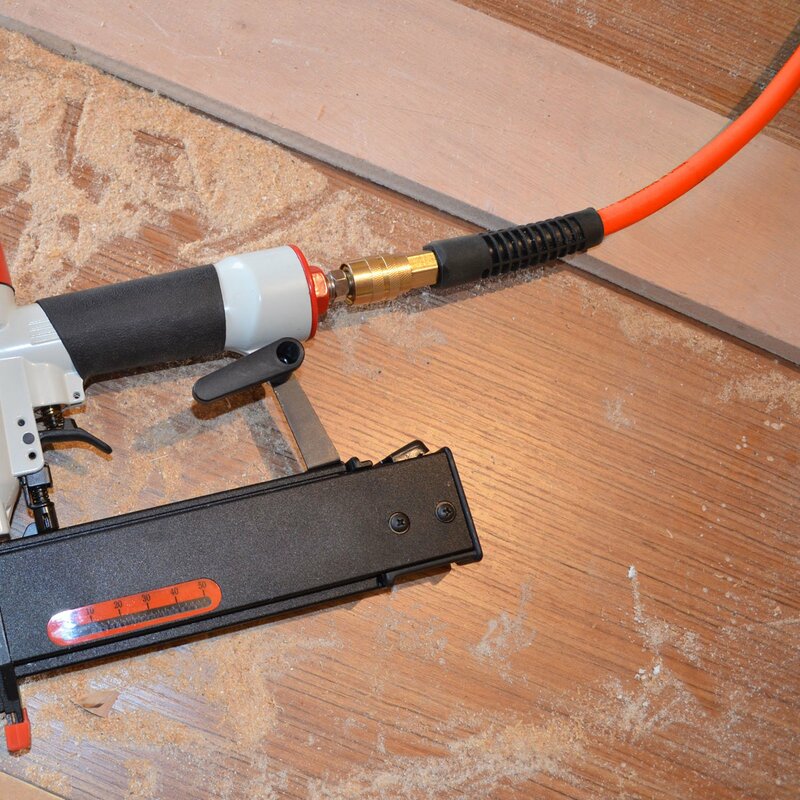 The smaller 1/4-inch size is good for those who need a lightweight hose such as contractors with finish nailers. We get into material types below. Here is an aftermarket hybrid air hose that has much to like about it. It really is a quality air hose product all the way around. The interior of this 50’ long air hose is made of a mix of different materials that help keep it from kinking up as it’s moved around. This compressor hose is fairly lightweight too at just under 4.8-pounds. It has a 300 PSI capacity and sturdy ¼” solid brass MPT connectors attached to both ends of it (male threads), making it ideal for heavy duty use. This is a nicely designed air hose that comes with a bonus. That’s because it includes a really nifty 19-piece accessory kit. At 25’ it’s a perfect size hose for smaller workshops. 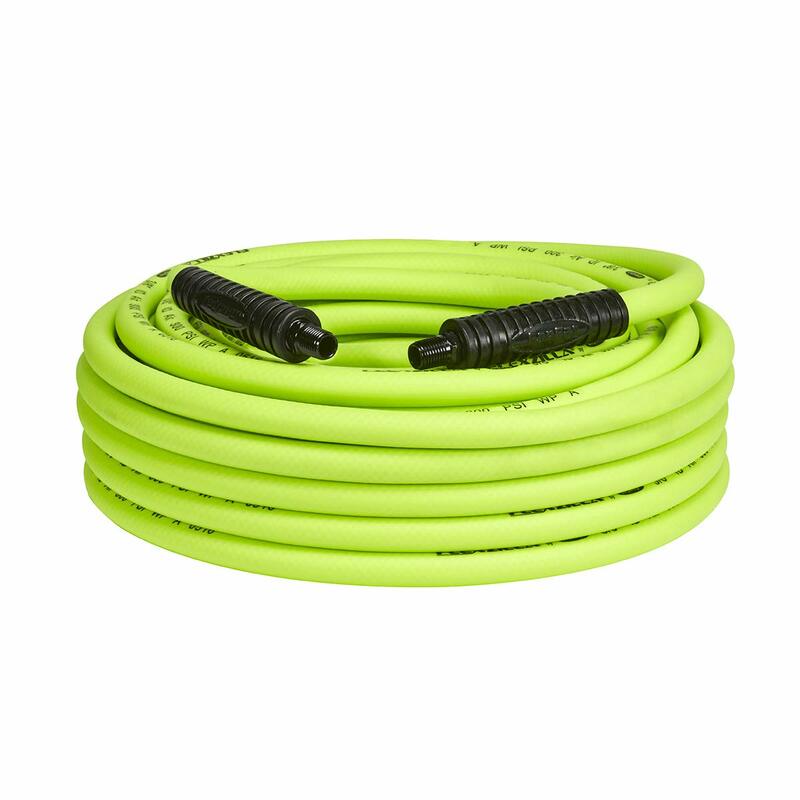 It’s super-lightweight for a sturdy hose that resists kinking and has a tough rubber outer cover. The 3/8″ size helps preserve CFM, keeping maximum volume to your pneumatic tools as you work. It’s also a compressor hose that is really easy when it comes to hooking up tools and nozzles. That’s because it features ¼” corrosion resistant brass quick connect fittings at each end of it. This air hose is rated for use at pressures up to 300 PSI and can be used for tire inflating applications at 10-50 PSI. Few companies know how to make great rubber better than Good Year does. Proof of that comes in the form of this solidly built 50’ rubber air hose from them. It features an abrasion and oil resistant EPDM rubber cover. That material is so strong they use it on commercial roofs to keep them watertight. This material even retains its flexibility in colder weather. If you have ever used a polymer blend hose you will notice this rubber hose is slightly more flexible than those. It also has a spiral synthetic yarn reinforced interior that helps it resist kinking. The corrosion resistant ¼” MPT connectors are made of high-quality brass. This company has a reputation for making very high-quality air compressor hoses. This hose from them is no exception. It’s a well-built contractor grade, hybrid rubber/PVC air hose. At 50’ in length, it’s suitable for both indoor and outdoor use. The interior of the hose is reinforced with spiral synthetic yarn to help it resist kinking and it helps keep the hose light in weight too. You can also easily hook it up to any compressor or add attachments thanks to its corrosion resistant ¼” male threaded brass connectors. This air hose has a good working capacity of 300 PSI. One of the best things about this Duryte Pro hose is that it’s backed up by a nice 3-year warranty. Here is one tough air compressor hose whose name even sounds tough. It’s an air compressor hose made by a company named ‘Flexzilla’. At 50’ it’s the perfect length hose for most outdoor and large shop compressed air applications. With its -40 to 150-degree working temperature, it’s the perfect all-weather compressor companion. It’s a hybrid polymer type air hose that resists kinking and has zero memory after its twisted or bent. This compressor hose also features crush resistant 3/8” aircraft aluminum fittings. Flexilla has also built this hose to be abrasion resistant and handle up to 300 PSI working pressures. Well, now you know that buying an air hose to use with your compressor is not as simple as you would think. With that being said, you should now have the exact information you need to make the proper air hose selection for the type of application you are using it for. The right air hose will definitely make any job you are doing that requires compressed air much easier. 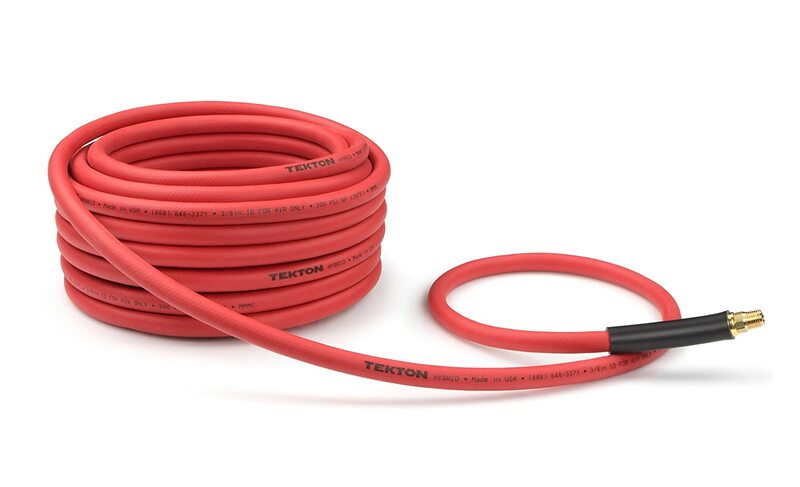 Of all the hoses I reviewed here, make sure you take a close look at the hybrid Tektron hose. It’s durable, cheap and is going to excel in most workplace environments. However, homeowners should jump up to a kit that includes the needed quick-connected accessories. It combines the best of all of the different air hose materials. It’s durable, flexible, resists kinking, and has a great bend radius. Here are some major points to consider when buying an aftermarket air hose to use with your compressor. If you want a hose that lies flat when rolling it out and does not kink, then you will want to consider purchasing a rubber air hose. They are also fairly reasonably priced and they are one of the types of compressor hoses that are very easy to roll up too. Rubber compressed air hoses are also readily available in the marketplace. Buying a rubber air has does have some drawbacks too. One of them is they typically don’t handle as high pressure as some other types of air hoses. Rubber also only offers medium cold weather flexibility and they are the heaviest type of air hose too. Consider this if you are using your compressor at many locations in a single day or have to pull your hose over great distances. If cost is your biggest factor when selecting a new air hose, then a PVC air hose might be just what you are looking for. They tend to be the least expensive type of air hose. PVC air hoses are also very light in weight and they can be used in a large variety of situations where compressed air use is required. These things make PVC air hoses a good choice for those who only occasionally use their air compressor. PVC air hoses do have one significant drawback though. They kink and get tangled up easier than any other type of air hose. These types of compressor hoses are quickly gaining in popularity. That’s because they last as long as rubber in many cases and they are excellent for use in colder temperatures. They also weigh significantly less than rubber hoses too. That makes them a favorite of painters and roofers who have to work at higher heights because these hoses take less effort to move. The biggest drawback with polyurethane is how stiff it is. That makes them prone to twisting, coiling and kinking on occasion. Polyurethane hoses are also susceptible to certain solvents and it’s in this materials nature to stick to itself at times too. This is one of the types of compressed air hoses that are prone to kinking the most. It is also one that coils up very easily and is hard to uncoil when it does. When you add in the fact that it’s the least durable air hose material you would think why would anyone by one. Think again though because they are a big seller. The fact that they coil easily is desirable in some situations and to some users; this includes places such as factories with assembly lines. Yarn air hoses are very similar to hybrid air hoses in that they have a different material on the outside of them. It’s the inside of the compressor hose that has the synthetic yarn added to it. You may have seen a plastic air hose of some type that has reinforced webbing or braiding inside of it. 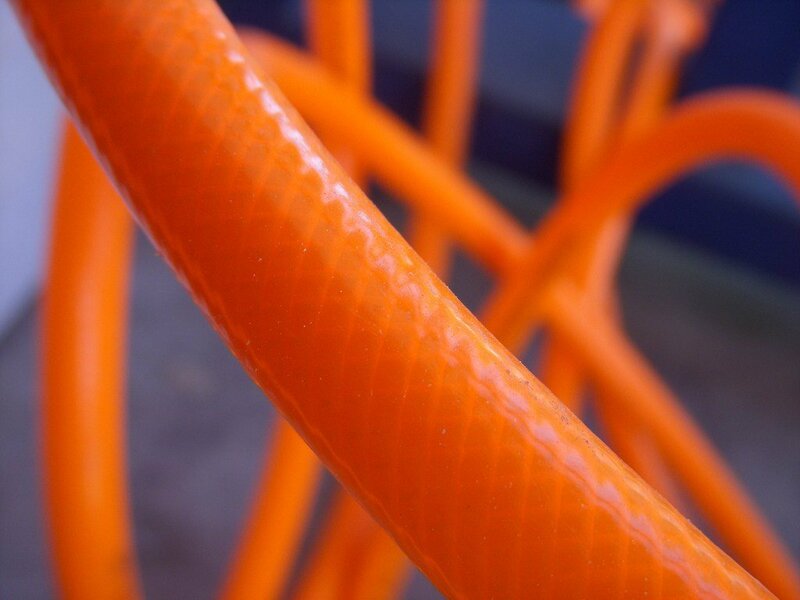 That’s exactly what spiral synthetic reinforced yarn looks like on the inside of an air hose. The synthetic yarn provides additional reinforcement so an air hose does not collapse, kink or bend too much. The name here is pretty self-explanatory. Hybrid hoses are a combination of two or more of the materials shown above. The most common combinations are PVC and rubber outers combined with spiral synthetic reinforced yarn. It makes for one tough air hose that is chemical resistant and resists coiling and kinking too. Also, don’t forget we mentioned that any type of hose that has spiral synthetic reinforced yarn to its interior will be very kink resistant. 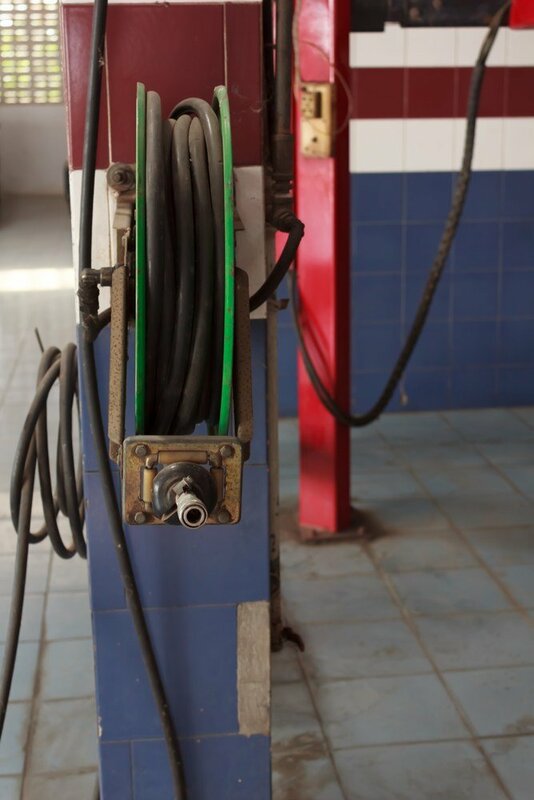 If you work in an auto shop that has plenty of different types of oils and liquids on the floor you will need a tougher hose that can handle that rough work environment. The same can be said for tough work environments or in shops that have more abrasive type floors. Here is the durability of each type of air hose material ranked best to worst. Some of your air hose length selection has to do with personal preference. The other part has to do with your working situation. 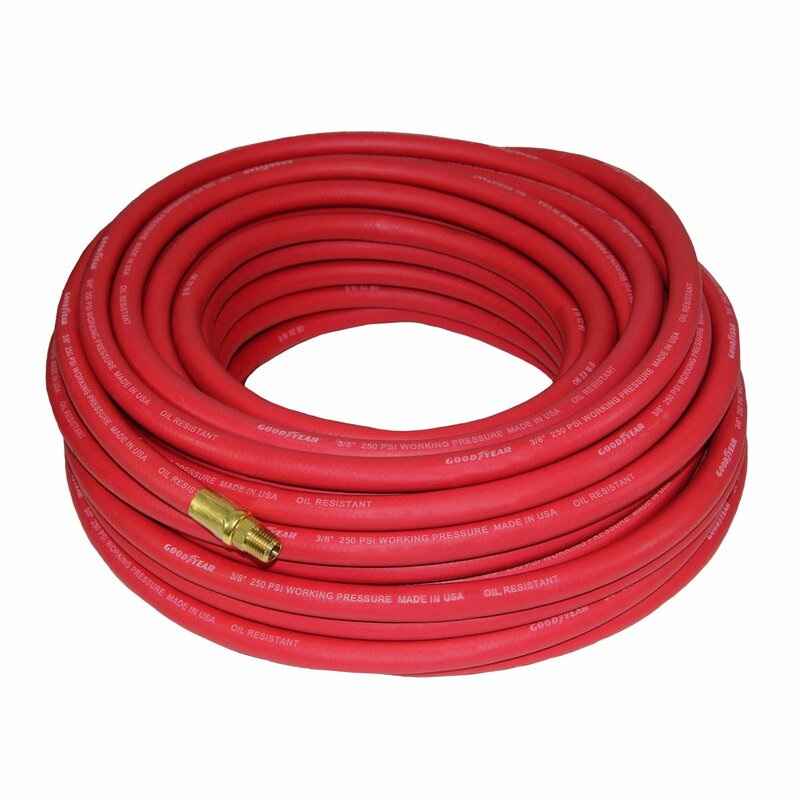 Typical air hose sizes are 25’, 50’ and 100’. Fifty is probably the most practical and most common size air hose that is bought. 25’ hoses work great in smaller shops and more confined areas where you don’t want extra lengths of hose constantly getting in your way. Most 100’ air hoses are made of PVC or polyurethane because it makes the hose lighter; these are commonly found being used by roofers and painters who need to pull long lengths of hose over large distances. Air hose openings are always measured by the inside diameter of them (ID), typical metric size hose diameters are 6mm, 8mm and 10mm and English system hoses are usually 1/4” and 3/8”. As a general rule of thumb, the more air pressure that the tools you are using need to run properly the bigger the inside diameter of your compressor hose needs to be. Also, you should use larger diameter compressor hoses on longer hoses (such as 100’) because of the inherent pressure loss that goes along with using them. Rubber hoses are great almost all of the year round but they are known to lose their flexibility in the colder months. That’s a great time to switch to using Polyurethane air hoses as their properties do not change as a result of the weather. The main drawback to MPT connections is the time it takes to put them on. They do however make a great seal if you tighten them up enough. Compressor hoses with this style of connection tend to be lighter, less expensive and less prone to failure than those with quick connectors. Try to get a hose where its MPT connections are made of brass or aluminum for better corrosion resistance. This stands for “National Pipe Tapering” threads. Their engineering standards are the ANSI/ASME B1.20.1 code. These were originally designed for plumbing and not for plumbing or pressurized settings. Accordingly, you will only see them in the 1/8″ or small hose sizes where the force is typically lower. These work great for environments such as auto repair shops and auto body shops where you are always switching between different power tools. It makes these tool switches go fast and easy. Quick connectors are more prone to wear and leakage than MPT threaded connections are. There are also many specialty connections that can be added onto the end fittings of most air hoses. These include specially made chucks whose sole purpose is to inflate tires. 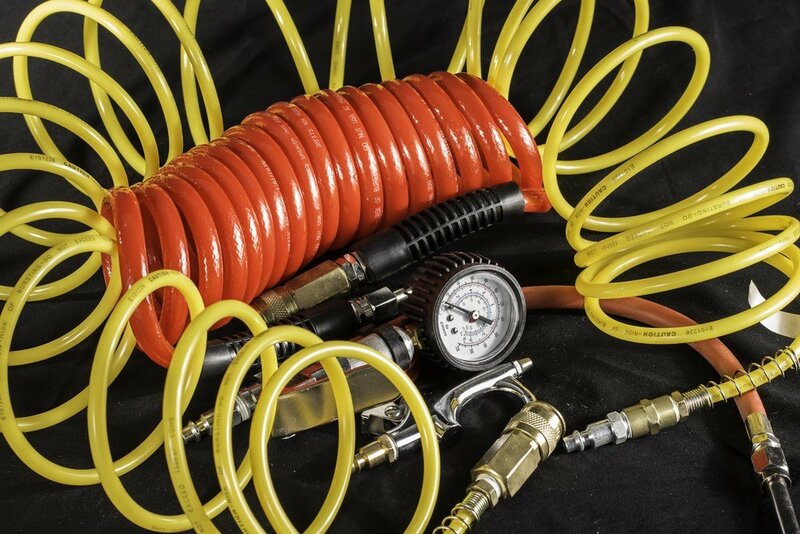 A shot of air hoses and air tools used with an air compressor. Most people when they are shopping will try to avoid buying compressor hoses that coil easily. This makes them harder to pull out and they kink more easily too. With that being said, there are certain situations where coiling of an air hose is actually beneficial. 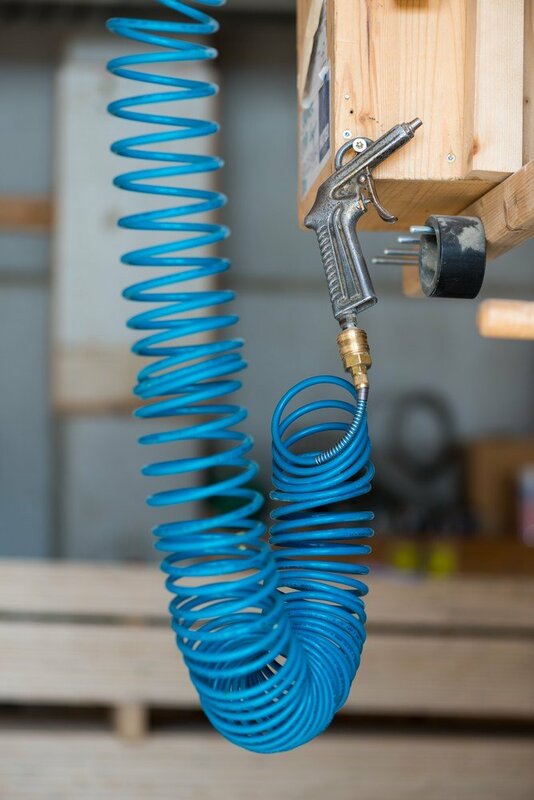 These are industrial situations where you want your air hose out of the way most of the time and in situations where working space is tight or you don’t need to pull out long lengths of compressor hose.